Thanks to the launch of a new smartphone device, diabetes sufferers in the UK will now be able to manage their condition using their iPhone or iPod Touch. 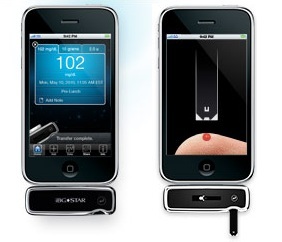 The iBGStar, which attaches to the bottom of the iPhone or iPod, comes with a free Diabetes Manager app, enabling users to monitor their glucose levels whenever, wherever. The device works by pricking the finger to take a tiny spot of blood from the user. The measurement is uploaded to the app instantly and the findings analysed. Using the technology built into the iPhone or iPod Touch, users can then share the information with their GP while on the go. Users will be able to track variations and trends in their blood sugar levels, and monitor their intake of carbohydrates, the amount of exercise they have done and how frequently they take insulin. iBGStar is available through Boots for £48.